The activities described on this website are intended for students under the direct supervision of teachers. The American Association of Chemistry Teachers (AACT) cannot be held responsible for any accidents or injuries that might result from conducting the activities without proper supervision, from not specifically following directions, or from ignoring the cautions contained in the lessons. 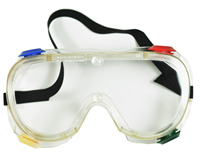 The term “safety goggles” used in the safety section of each resource refers to chemical splash goggles, an example is shown in the picture to the right. Updated safety guidelines for high school chemistry labs, from the American Chemical Society, Committee on Chemical Safety. Use this simple template with your chemical demonstrations and laboratory experiments to help you recognize hazards, assess and minimize the risks of those hazards, and prepare for emergencies. CSS promotes and facilitates safe practices in chemical activities. Visit their website for access to a Student Laboratory Code of Conduct, and other safety guidelines for the classroom. OSHA maintains a chemical database with data regarding physical properties, exposure guidelines, and emergency response information. Discover resources for younger students, such as Safety In the Elementary Science Classroom, and Milli's Safety Tips for Children. Offered to AACT and ACS members at a cost, this policy provides coverage tailored to chemistry Educators. It provides protection against risks within classrooms, teaching and research labs and community outreach activities. This safety guide provides an inventory of hazardous substances teachers may be using with their students, an easy-to-read reference to create a safe learning environment in the lab for students, and information to take precautionary actions to prevent or minimize hazards, harmful exposures, and injuries in the lab. High school and middle school teachers can take advantage of Flinn’s free safety training. The course touches on how to design a safe lab, chemical storage area cleanup plans, among other safety topics. The CSB released a safety bulletin in the wake of several methanol accidents, "Key Lessons for Preventing Incidents from Flammable Chemicals in Educational Demonstrations." A collection of safety-related content compiled by King County, Washington. The website provides a variety of resources including alternative labs setups, using green chemicals, proper chemical disposal, safety videos, and more. Chemical Disasters: Good Chemicals gone Bad! It's All Right if You Don't Know, Just Be Safe! Why (not) Inquiry Labs? It's easy!